Main Street Liberal: Rove Wanted Chemical Weapons Dead And Buried. Very Wise Politics. Rove Wanted Chemical Weapons Dead And Buried. Very Wise Politics. Pun intended: Rush Limbaugh's claim that the chemical weapons which were reported this week to have been found several years ago in Iraq constitute a smoking gun in the hands of Sadaam Hussein is a crock of manure. The weapons of mass destruction The Daily Beast is talking about is not the same weapons that both Republicans and Democrats and every intelligence service in the world claimed were being manufactured by Saddam, 1998-2003. These are not the WMD we're talking about. These were basically chemical weapons that are prior to 1991. It doesn't matter. They were found in 2004. They were discovered by US troops in 2004 and they show that Saddam was investing and manufacturing weapons of mass destruction. It could have spelled out exactly who Saddam Hussein was for anybody who didn't want to believe it. It could have spelled out exactly why Saddam had to be targeted. It would have spelled out and made clear why Saddam Hussein had to go. Everyone knew who Sadaam Hussein was and everyone then and since has acknowledged it. There was no prominent domestic supporter- or apologist- of the Iraqi president. 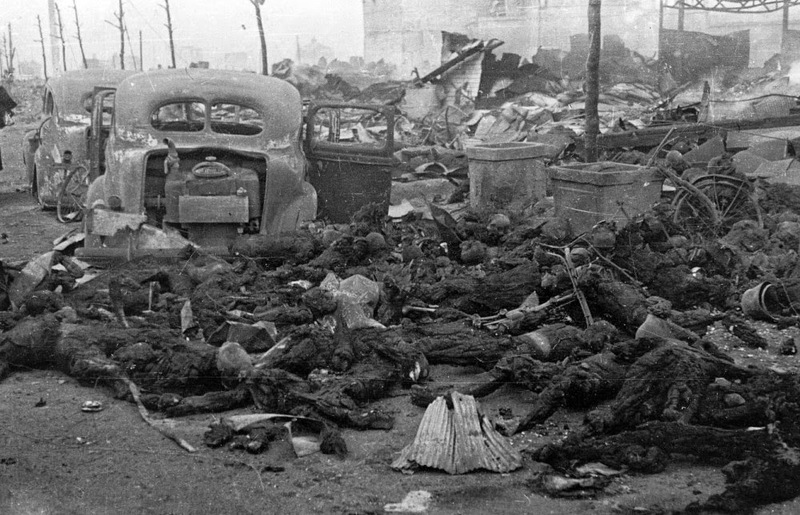 We knew from the time of Iraq-Iran War, recognized Hussein's policy of genocide against the Kurds, and realized that he had at one time stockpiled chemical and biological weapons (photograph below depicting result of an actual weapon of mass destruction, in Hiroshima, from Nuclear Darkness). We understood, further, that U.S. and British intelligence services had reported that the dictator probably had an active chemical and/or biological weapons program, though it was not fully understood that the intelligence had been twisted by the Administration to justify the war it was determined to launch. It was known- though under emphasized- that Mohamed ElBaradei shortly before the invasion had testified that the International Atomic Energy Agency had found no nuclear weapons activity in Iraq. Look at all that turned out to have been accurate about this. If I'm a member of the Democrat Party all during this, I have to be really scratching my head, saying, "Why are these guys shutting up? Why are we getting away with this? Why are they letting us get away with lying about them and this war every day?" And after a while you stop asking and you just keep piling the lies on top of one another. What we're told here is, the active theory was, "Well, that's 2003, 2004, 2005. We lost that battle. We didn't find any weapons of mass destruction then, and it just won't work to tell everybody we have now, 'cause they won't believe us and they'll think we're lying. Better to let sleeping dogs lie and just move on to the next news story." Those five years drove me nuts, too. Not insane with rage, but disbelief that the news was so filled with lies and so filled with distortions every day, with not one day of reality. The discoveries of these chemical weapons did not support the government’s invasion rationale. After the terrorist attacks of Sept. 11, 2001, Mr. Bush insisted that Mr. Hussein was hiding an active weapons of mass destruction program, in defiance of international will and at the world’s risk. United Nations inspectors said they could not find evidence for these claims. Then, during the long occupation, American troops began encountering old chemical munitions in hidden caches and roadside bombs. Typically 155-millimeter artillery shells or 122-millimeter rockets, they were remnants of an arms program Iraq had rushed into production in the 1980s during the Iran-Iraq war. All had been manufactured before 1991, participants said. Filthy, rusty or corroded, a large fraction of them could not be readily identified as chemical weapons at all. Some were empty, though many of them still contained potent mustard agent or residual sarin. Most could not have been used as designed, and when they ruptured dispersed the chemical agents over a limited area, according to those who collected the majority of them. In case after case, participants said, analysis of these warheads and shells reaffirmed intelligence failures. First, the American government did not find what it had been looking for at the war’s outset, then it failed to prepare its troops and medical corps for the aged weapons it did find. As Iraq has been shaken anew by violence, and past security gains have collapsed amid Sunni-Shiite bloodletting and the rise of the Islamic State, this long-hidden chronicle illuminates the persistent risks of the country’s abandoned chemical weapons. Many chemical weapons incidents clustered around the ruins of the Muthanna State Establishment, the center of Iraqi chemical agent production in the 1980s. Since June, the compound has been held by the Islamic State, the world’s most radical and violent jihadist group. In a letter sent to the United Nations this summer, the Iraqi government said that about 2,500 corroded chemical rockets remained on the grounds, and that Iraqi officials had witnessed intruders looting equipment before militants shut down the surveillance cameras. During his rant, the man who continually derides Democrats as "low information voters" charged Newsweek is "a bumbling, leftist operation." Presumably corrected by his producer during the commercial break, he returned to admit "yes, yes, yes. I know Eli Lake is a solid conservative." Limbaugh now knows Lake is a foreign policy analyst rather than left-wing activist, but he still doesn't understand that if it hadn't been for Karl Rove burying the chemical weapons story, he would have spent less time the following four years defending George W. Bush than condemning President Kerry.